Artolazzi: Why is Blue Dog Blue? 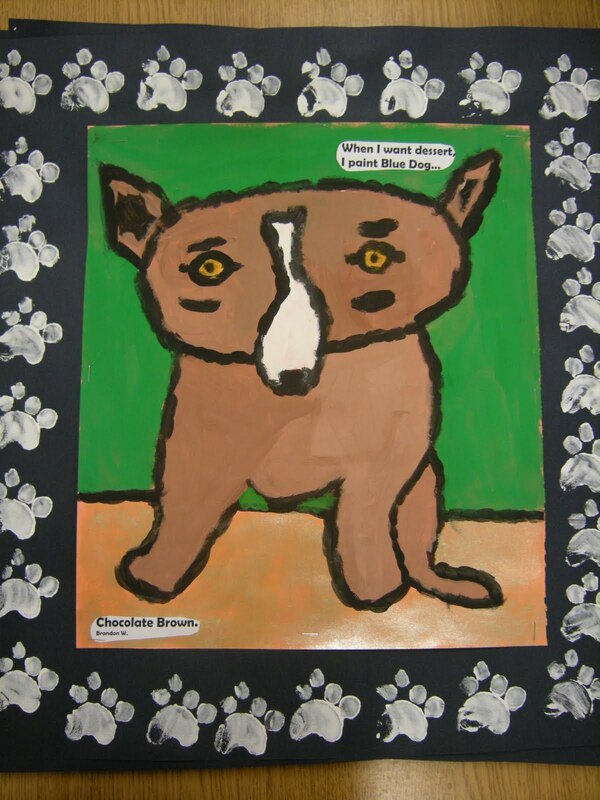 In Art class, 4th graders studied the artist George Rodrigue. 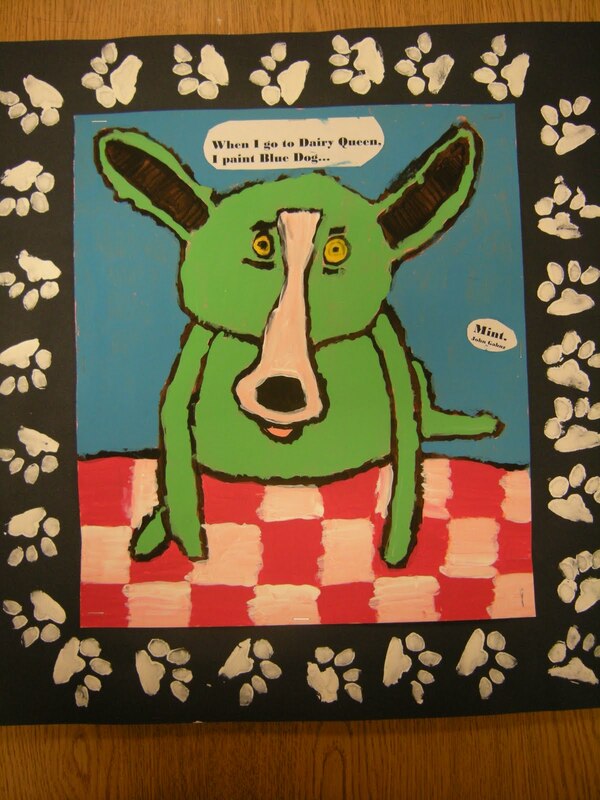 He is from Louisiana and is most famously know for his Blue Dog paintings. 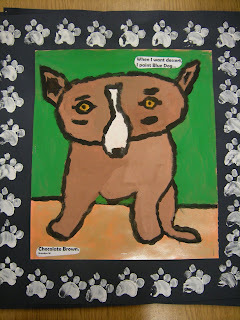 When George was young, he had a pet dog named Tiffany that he loved dearly. He paints Tiffany mostly blue in his artworks. 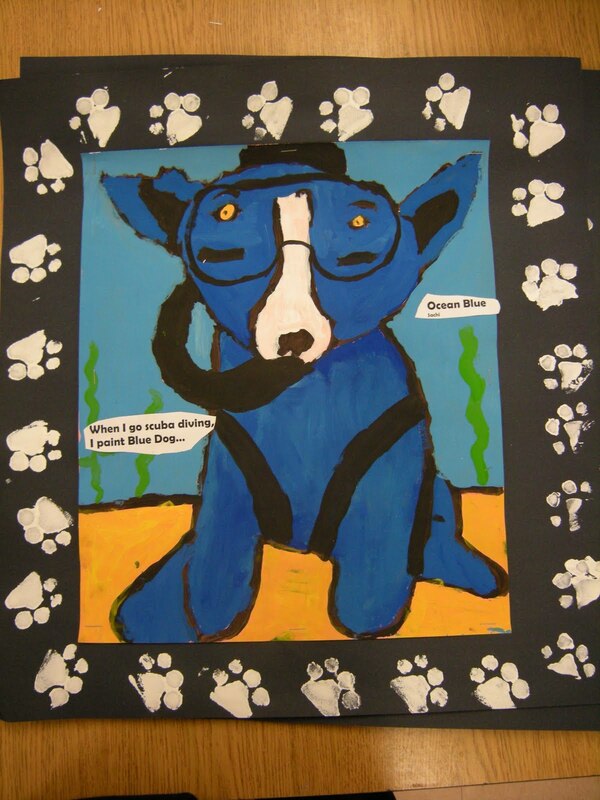 We read the book, Why is Blue Dog Blue? 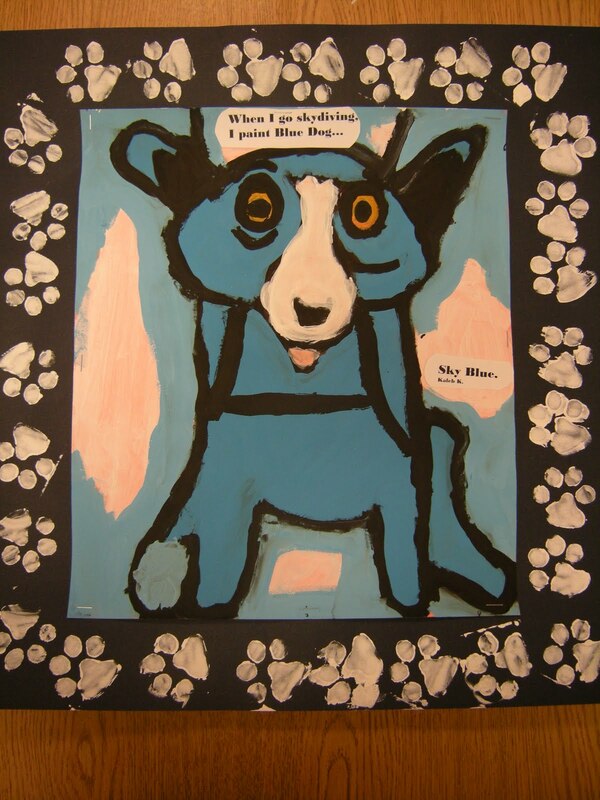 by George Rodrigue which explains that Blue Dog’s color depends on what the artist is doing: when Rodrigue goes fishing, he paints the dog a salmon color; when Rodrigue wants a hot dog, he paints the dog mustard yellow, and so on. 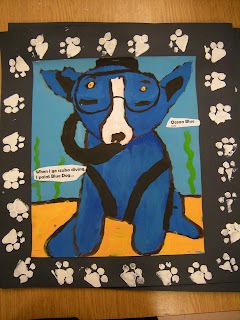 4th graders had to create a sentence that explains what color they would paint Blue Dog when they are doing something. 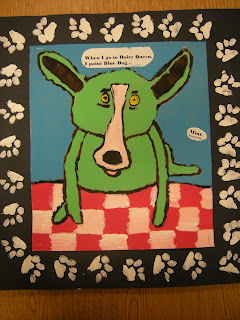 Then they painted a picture that goes along with their sentence. Great! I never heard of Rodriguez, until I visited New Orleans last summer and saw his work. Thanks for this lesson. These are so much fun! I love the paw print borders. Thanks everyone! The stamps I premade. 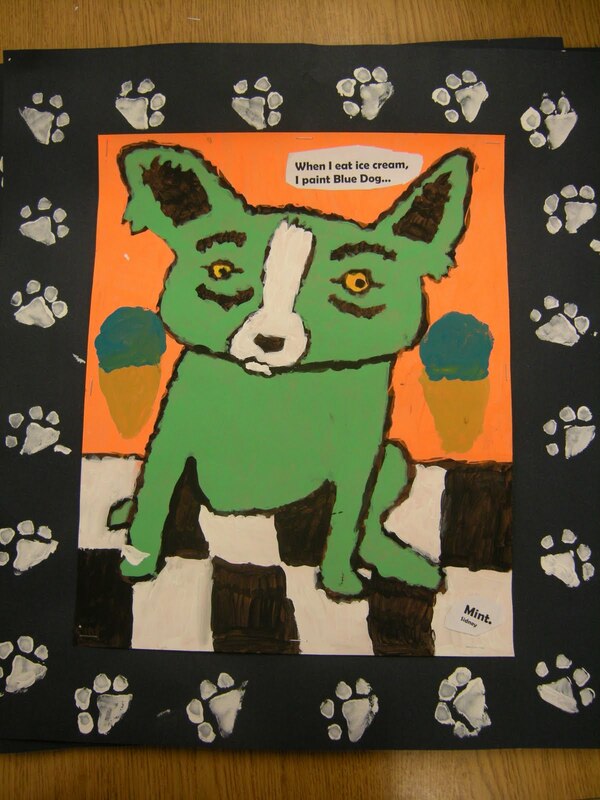 I just used foam paper to cut the paw prints and then glued them onto a small block of wood :) The kids used a brush to apply white tempera each print. I love the clay fish that are posted at the top of this page. Could you please tell me how you made them or give me a few basic instruction on how they were constructed. I love the painting/drawing technique too. Any information you would be willing to share would be greatly appreciated. Jean, we make the clay fish in one day. the kids roll out slabs. i give them a stencil that looks like a football for the start of thier fish, this way the dont make them too big or too small. they strace the football stencil onto their clay, then draw on fins and tail. next they cut out the fish w/clay knife and trace the clay fish again onto new slab. so now they have two identical fish slabs. next they stuff 2 paper towels between the fish and pinch fish closed, excpet for bottom. they stand the fish up and add details and side fins! next art class, they color their fired fish w/consrtuction paper crayons, then bring it up to me and I india ink it w/a large brush in the sink! i wrote this fast, but hope this helps!